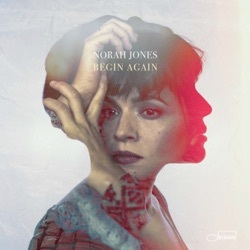 Begin Again is the seventh studio album by Norah Jones, released by Blue Note Records from Capitol Records on April 12, 2019. This is clever, satisfying work. The songs on Begin Again are eclectic in style, from hints of jazz to more gentle notes of folk and Americana, such as on the haunting A Song With No Name. The casualness of it more or less wins the day. A candidate for one of the greatest albums of 2019. It lives up to Jones' specific styling while also combining her various influences. Begin Again finds itself trapped and wishing for a wider expanse. Begin Again is remarkably smooth and cohesive from start to finish. A small album by the Grammy winner that scores with beautiful indecision and two Jeff Tweedy productions. Norah Jones succeeds with " Begin Again " an informal EP, whose recordings have made it much easier to feel fun. A collection of seven beguiling singles released over the past two years, it cements her reputation as a musician who just keeps getting better. A reminder that Jones has enough talent and self-awareness—those two are rarely in concert with each other—to try her hand at multiple genres without stretching herself too thin. Begin Again revels in exploration, proving no territory is inaccessible to Jones. It’s an entertaining assortment of Jones unrestrained. A beautiful collection that she has recorded with friends and colleagues such as Jeff Tweedy, Thomas Bartlett, Brian Blade and Christopher Thomas. Begin Again is a diverse little collection that sees Jones experimenting with some new sounds while having fun. The same musical personality, bending both modernist and vintage sounds to fit her worldly, meditative songwriting.